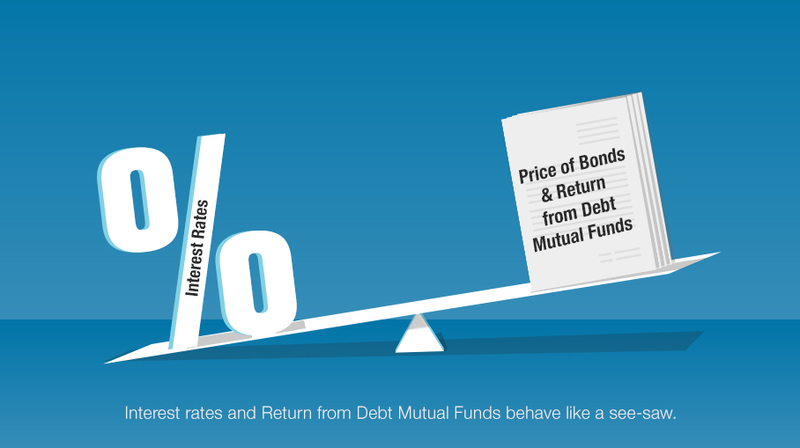 How do interest rate changes affect my return from Debt Funds? Debt Funds invest in fixed income securities like corporate or Government bonds and money market instruments. These securities are interest bearing instruments that pay a fixed interest (coupon rate) to investors at regular intervals and pay the invested amount (principal) at maturity. The prices of these securities are directly affected by interest rate changes. Bond prices and interest rates are inversely proportional. A bond’s coupon rate is fixed at the time when the bond is first issued at certain price (Face Value). If interest rates fall below the coupon rate, the bond looks more attractive as it carries higher interest than currently available in the market. Hence, demand for such bonds go up, pushing their prices up. If interest rates rise, these bonds look unattractive and their prices fall due to lower demand. When interest rates rise, prices of fixed income securities fall. This leads to a decline in the NAV of fixed income funds that hold these securities in their portfolio. On the other hand, when interest rates fall, prices of fixed income securities rise, leading to an increase in the NAVs of fixed income funds. Thus, you get a positive return from your fixed income fund investment when interest rates fall and vice-versa.